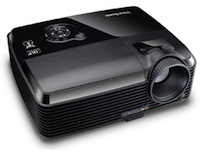 ViewSonic has rolled out a new WXGA DLP projector with stereoscopic 3D capabilities. The new projector, the PJD6531w, displays 3D and 2D images at a resolution of 1,280 x 800. It also offers a 3,200:1 contrast ratio and a brightness of 3,000 lumens. It's designed for use in classrooms or in larger facilities, with throw distances ranging form 3.9 feet to 32.8 feet and image sizes ranging from 27 inches to 300 inches. The PJD6531w is a networkable projector, with an RJ-45 port for LAN connectivity and support for network remote control. Video inputs include two RGB ports (15-pin mini D-sub with component support), HDMI, S-video, and composite video. It also offers RGB out and audio I/O via stereo minijacks. The projector is currently available and ranges in price from $700 to $830. Further information is available here.